I'm finally linking up with Doodle Bugs Teaching for her Five for Friday! I just couldn't seem to get a Friday post together during the school year.....BUT I am FINALLY on summer break!! At least the rumor is that this was my first full week of summer break. If you read my five random things below you will see why it is just a rumor!! Well I did have a little break last weekend. My mom and I got my hubby and my dad a NASCAR driving experience. So we all went to Illinois for the weekend to the Chicagoland Speedway so they could drive fast! It was fun and we made a detour to one of my favorite stores IKEA! Then Monday came....you know the first official day of summer break, but not really because we had to be back at school for an all day in-service on our new reading workshop model for literacy next year. The in-service was actually really good and I am glad I have the rest of the summer to review all of the information and plan what my literacy block will look like. Tuesday I actually had the day off!!! Yay! I might have stayed in my pajamas all day...maybe....and I might have taken a nap too! Wednesday my break was over! I had to be back at school for our summer school meeting and summer school classroom set up. Which really meant I had to move a bunch of stuff from my classroom to a different building for summer school. That is because when I got to my summer school classroom there were no books in the reading boxes for summer school. I thought it might be kind of tough to teach reading review/enrichment to kindergartners without books. Hence the moving of what felt like half my classroom! I'll end with some good news from the week......I finally got my new laptop!!!!! Yup that is what I am writing this post on right now! I am so excited!! I spent tonight moving all of my clip art and files from my old computer to this one, but it is sooooo worth the effort! I will soon be creating some new products and freebies for you! 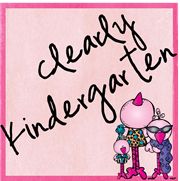 On another note....my fellow WI bloggy buddy Erin at It's Owl Good in Kindergarten is having her 100 follower giveaway this week...so fly on over and enter. 3 people will win items from some great bloggers! We are also in the process of planning a WI blogger meet up so stay tuned! And lastly I am jumping on the Bloglovin bandwagon. Don't forget to transfer all of your blogs to bloglovin so you can continue to follow all of your favorite bloggers when Google Reader goes away on July 1st. It was super easy to do. Love IKEA! Great blog!! I nominated you for the Liebster Award! !